Cross section of a unibody table with one inch oversized framed slate, solid wood rails, T-nut rail bolts and Accufast American cushions. The best rails will bolt through the slate, not next to it (where they can shift) or into the side of the slate (where they can crack the slate). Bolting through the slate helps achieve the rigidity that we discussed previously in the Slate section (approximating the concrete wall). It also assures that the cushion be kept in the exact correct position in relation to the ball and the opposite cushion. There are many ways to secure rail bolts to the rail, and they do make a big difference in play. Floating nut plates are easy on the installer and the manufacturer – however, they loosen easily (though they are easy to re-tighten) and leave 18 spots along the rail where the ball bounces differently than along the rest of the rails. Barrel nuts also can loosen dramatically in time – and once the nut loosens, it can’t be fixed without major work. Nut plates held on by very small screws are easy to repair, but they can’t be tightened as well as the others in the first place. The most common method on domestic tables is the T-nut which is held in place by the rail cap. It requires the manufacturer to be much more precise when making the table, so it is usually found only on the more expensive models. However, it is the most stable and strongest method in use. Full profile, molded gum rubber cushions will allow the fastest rebound for the balls. Most regulation cushions used on American tables are actually made in China or elsewhere in Asia. American and German cushions are also available; giving a more accurate bounce and a faster game. BCA regulations require that the cushion impact point be 62.5% of ball height within ± 1%. Above this height will tend to push down on the ball, and slow it down. Below this height will tend to lift the ball off the table for a short hop – losing energy and control. Attempts to increase the speed of Asian cushions have tended to make them less accurate. Improving their accuracy or consistency has tended to make them slower. German cushions, as you might expect, are more accurate, and a little faster. The gold standard in cushions available today are the Accufast™ cushions made by VIP Rubber in California. They are expensive, but they are noticeably faster and more accurate than any others. Even the least experienced player can usually see the difference. If you find a table you like that does not have Accufast™ cushions you may wish to pay to have your cushions replaced with Accufast™ . It will be expensive but it will be worth it. Asian cushions often last less than eight years, when they are more likely to just come loose in spots rather than to wear out. Generally, they will have a ninety-day warranty, even if the rest of the table has ten years or more. A cushion held on by 1½ inch of glue will last longer than one held on by ¾ inch of glue. Asian cushions also may start to harden, crack and lose their “bounce” in less than ten years. The best American cushions typically last twenty to fifty years. The very best cushions will even have a lifetime warranty that includes labor. 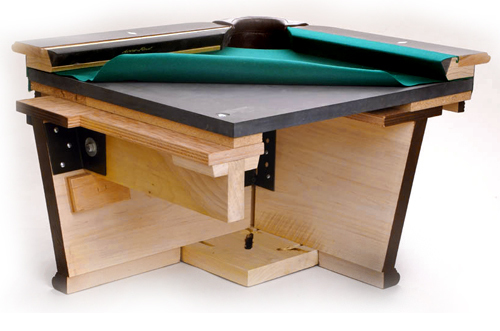 Solid wood top rails form a better surface for stapling the billiard cloth and gluing the cushions. Being more dense, they also allow a faster, more solid rebound for the ball. The wider rail found on a modern-style table will also allow a better rebound than a lighter or thinner rail, though it’s probably not a large enough difference to warrant taking a style that doesn’t match your decor. For the absolute finest play, find a modern-style table in which the rail system is built at the factory in one large piece instead of six smaller pieces. This assures that each rail is always at exactly the same distance and angle from its opposite. This feature is not available on an antique style (leather pocket) table, because it would look really ugly. However, most people still prefer the antique look. Particle board or MDF rails will be fine in the short run, but they will probably not hold up to the frequent recovering that will be usually done in a busy billiard parlor or pool hall, and they will slow the game a bit.